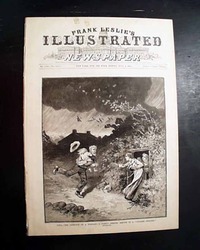 FRANK LESLIE'S ILLUSTRATED, October 26, 1889 The full front page shows: "Dangers of Electric Wires in New York--Western Union Lineman burned to Death in Mid-Air." 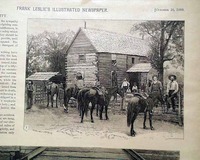 A rarity is to find period prints of cowboys, but here is one. 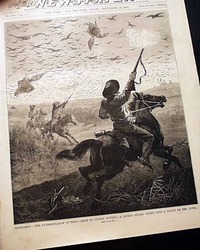 An inside page has 3 prints, captioned: "Life Among the Cow-Boys of Indian Territory" (see), with a brief, related article on an inside page. 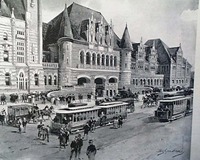 Tacoma, the terminus of the Northern Pacific Railroad on Puget Sound" which shows Mt. 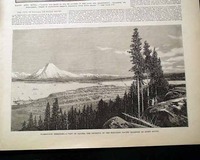 Ranier in the background. 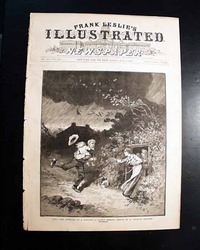 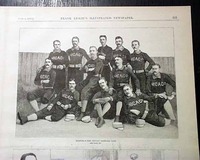 A related article as well. 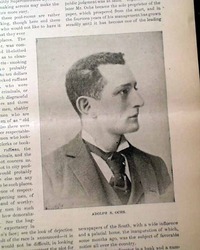 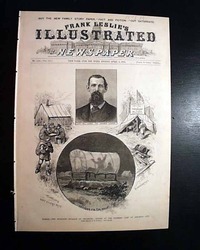 FRANK LESLIE'S ILLUSTRATED, New York, March 30, 1893 Of special interest is installment #7 of "Notable Jews - Adolph S. Ochs" which also includes a photograph of him. 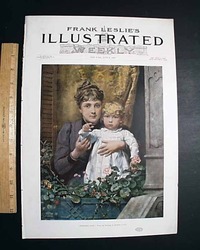 This is a series which ran in Leslie's for much of the year (others available: inquire). 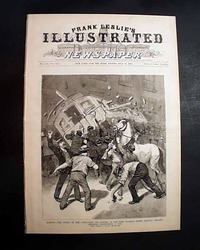 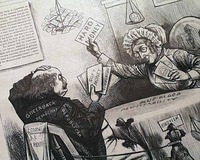 Ochs was publisher if the famous New York Times. 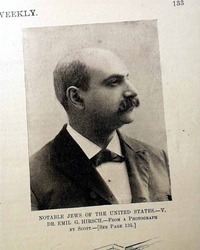 Of special interest is installment #5 of "Notable Jews - Dr. E. G. Hirsch" which also includes a photograph of him on a preceding page. 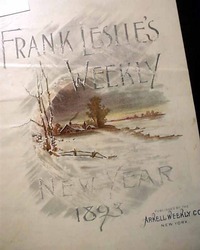 This is a series which ran in Leslie's for much of the year (others available: inquire). 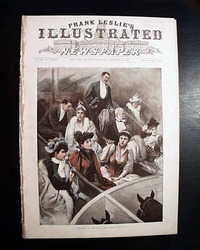 FRANK LESLIE'S ILLUSTRATED, New York, Aug. 4, 1892 The full front page is a very nice & displayable color print: "Viewing The Regatta of the Atlantic Yacht Club". 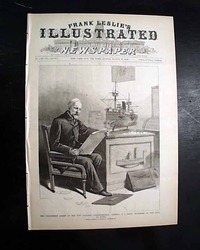 Inside has 8 prints: "From Chicago to the Sea--Characteristic Sketches of our Inland Waterways", "The Attempted Assassination of H.C. Frick, Chairman of the Carnegie Steel Company". 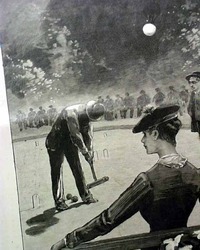 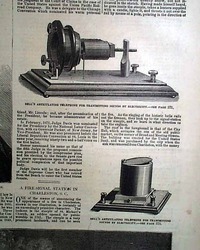 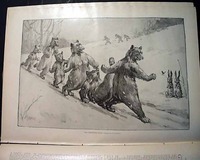 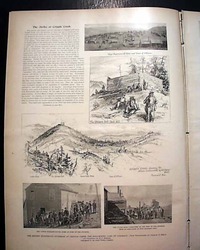 FRANK LESLIE'S ILLUSTRATED, New York, June 7, 1890 The full ftpg. 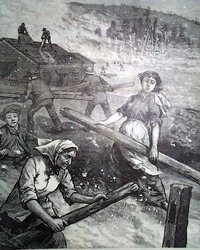 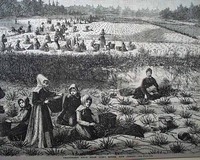 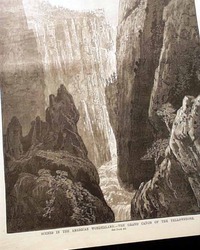 is a great illustration which seems as though it was taken from the Western movie, captioned: "Life in the Mining Regions of the Far West--Selling his Life Dearly." 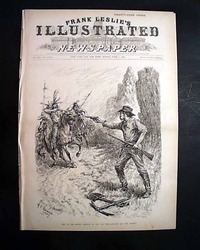 showing a cowboy trying to fend off a group of Indians on horseback (see). 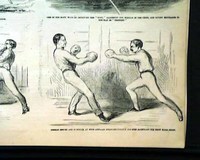 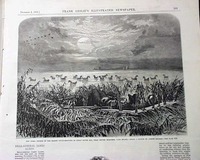 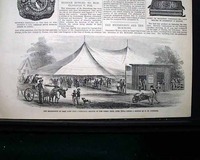 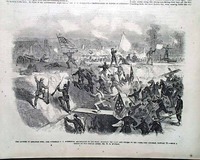 FRANK LESLIE'S ILLUSTRATED, New York, July 11, 1885 The full ftpg. 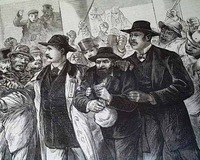 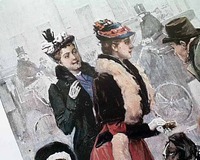 shows: "The Strike of the Conductors & Drivers...Chicago. 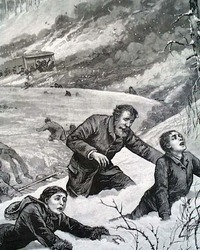 Strikers Overturning a Car". 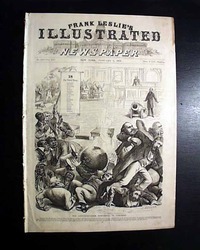 Inside has a fullpg: "New York City--The Two Sides of Life in Ludlow Street Jail" "Virginia--The Oyster Industry of Norfolk." 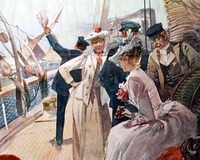 and "Scenes at Chautauqua Lake" and more. 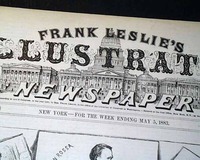 FRANK LESLIE'S ILLUSTRATED, New York, Dec. 30, 1882 The full front page shows: "Old Time's Stock In Trade For 1883" which shows Father Time. 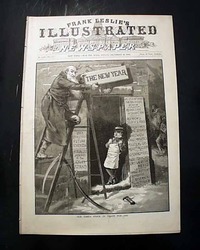 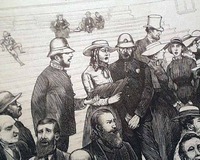 The doublepage centerfold is a large montage of prints captioned: "Pictorial History of Leading Events of the Closing Year", & which features Father Time as well. 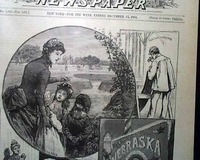 FRANK LESLIE'S ILLUSTRATED, New York, Feb. 6, 1892 The very handsome front page shows two women, a child & a man: "Driving A Bargain." 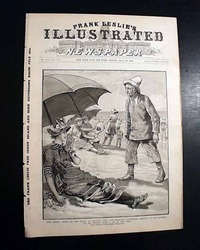 Done in full color--unusual for front pages at this time--making it a very nice display item. 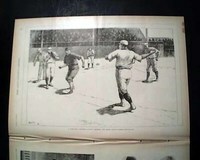 Twenty pages, in very nice, clean condition. 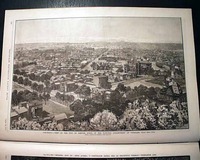 The most notable print would be the very nice full page print captioned: "Colorado--View of the City of Denver..." which is a great overview of the city at that time. 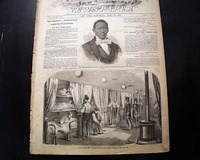 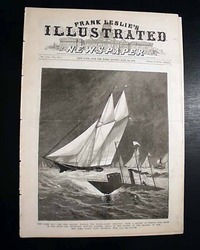 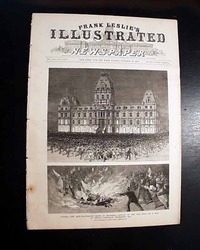 FRANK LESLIE'S ILLUSTRATED, New York, July 15, 1871 The front cover contains a half page illustration "Yachting - At the Helm" along with two smaller illustrations of the Cape May Regatta prizes. 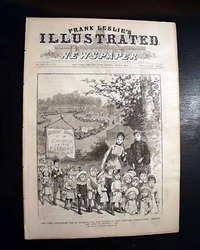 FRANK LESLIE'S ILLUSTRATED WEEKLY, New York, June 2, 1892 Occasionally this title had beautiful color prints on their front pages, and this is one of the better ones (see). 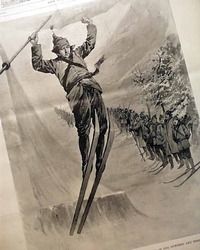 The print is captioned: "Good-Bye, Papa." 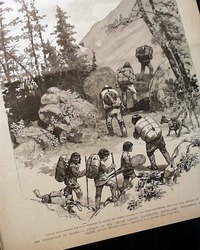 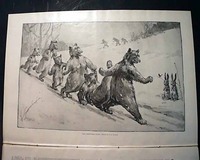 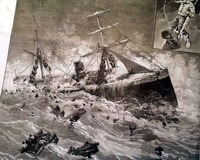 taken from the painting by Seymour J. 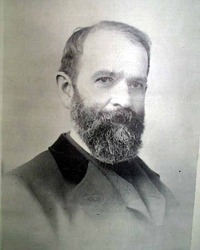 Guy. 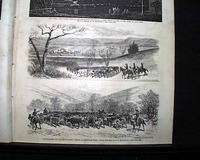 Sixteen pages, a spot in the bottom margin, otherwise in very nice condition.